Discipleship Groups – Discipleship is at the core of Tradecraft, and it can be used as a part of your regular discipleship process, whether Sunday School classes, small groups, or any other group discipleship format. Tradecraft helps the disciple learn practical ways to live out the Great Commission, an important part of following Christ. Training Church Members for Local Missions – The tools in Tradecraft are employed regularly in overseas mission, but they can be just as fruitful in local mission. If you want to impact the local community with the gospel, you have to know the culture found therein. 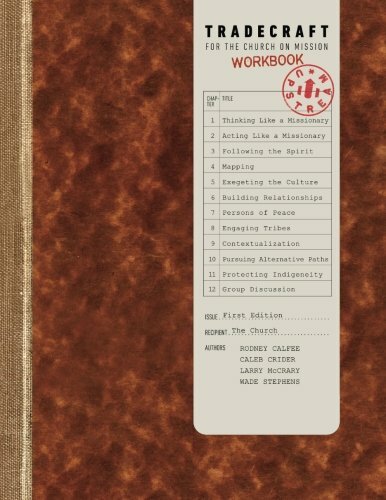 This workbook will walk your local mission teams through employing missionary tools in their own neighborhoods. Church Planting Core Team – Planting a healthy church also requires an intimate knowledge of the people and place into which it will be rooted. Walk through this workbook with your team and learn your city and its people well. We believe this information belongs in the hands of every believer and can be walked through with any group that simply wants to more effectively engage in mission in their own neighborhoods or around the world. We hope you enjoy the book and find it both meaningful and helpful! Tradecraft Workbook is available for purchase on Amazon for only $12.99. Kindle version is coming soon. For bulk orders and pricing please contact us at info@theupstreamcollective.org.